In the last few months we have been selectively picking Auto Ancillary Stocks and shifting after making good gains. The last 3 good trades were Autoline Inds 140 to 180/200. Motherson 155 to 185 , Auto Corp Goa 320 to 390 the next pick we have come down to is Rico Auto which looks interesting with medium term outlook. The stock should ideally target 40 levels in medium term. Recommended in Delivery Gains/QuickGains at 29/27 :). Intended purchase over. TECHNICAL ANALYSIS TRAINING SESSION MUMBAI scheduled for Sept 4-5. For more details get in touch with Kazim 09821237002 to confirm your seat. NEW OFFERING : Please look into the document below to get our ADVISORY SERVICES AT ABSOLUTELY ZERO COST !!! Will put a post on it soon..Click below to know the details. 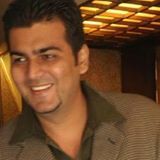 Hi sir , This is Ashish and shall i buy RICO AUTO INDUSTRIES ? and medium terms is for a month or more than that? 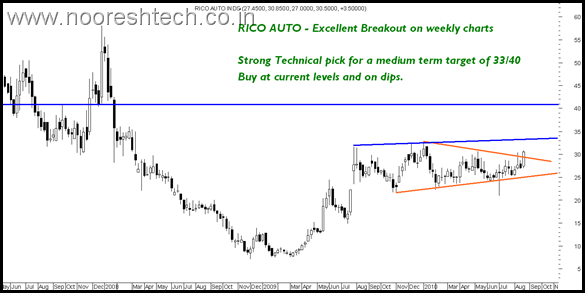 plz recommend thanks ..
we have come down to is Rico Auto which looks interesting with medium term outlook. Hello sir i got RICO Auto at rs 30 after that stock fall shall i buy more any advise ? and what is gold up to for september month ? will it going to touch and cross new high or a fall? gold maximum , minimum for september month any recomendattion ? Sir bought some lincoln pharma and rico auto n sold camlin n rishi laser … Where should I look to book gold … Bought 2 mini at 18050 (1180) . Is the rally going to continue and will it surpass 1270 within the next mnth … Don’t ask for my identity .. I m just a well wisher n a follower for abt 4 yrs .. Keep Rocking !!!! Sir bought some lincoln pharma and rico auto n sold camlin n rishi laser … Where should I look to book gold … Bought 2 mini at 18050 (1180) . Is the rally going to continue and will it surpass 1270 within the next mnth … Don’t ask for my identity .. I m just a well wisher n a follower for abt 4 yrs .. Keep Rocking !!!!!!! I bought Rico Auto aroung 30 range and holding it. Can i accumulate Rico auto now or come out from this range. what would be the stop loss for this?? Market has crossed 5750 and Mr. Rico Auto is down. Does it still look good for your targets (1-3 months)? I bought at 30 levels. I think u need to get ur basics right 🙂 Market is of Nifty 50 stocks 🙂 And it does not mean that all stocks will go up !!! Wokay sir. Will keep patience for the next 3 months…Thanks!